figure 10.21 Longitudinal section of PeJtastrobus ree-dae showing sporangiophores of several nodes and sporangia (Pennsylvanian). Bar = 4 mm. 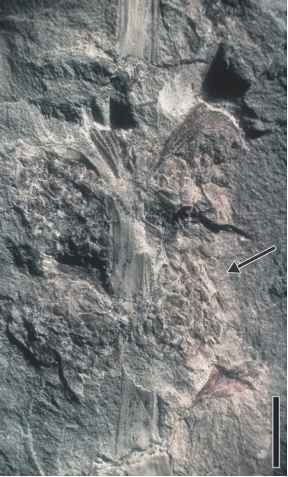 figure 10.22 Transverse section of PeJtastrobus reedae cone (Pennsylvanian). Bar = 2 mm. Pennsylvanian of the Appalachian Basin. These small (1.4 cm in diameter) cones have three appendages per node, each of which dichotomizes in a horizontal plane. Subsequent dichotomies of the upturned ends of the appendages produce spinelike tips. Both PeJtastrobus and Sentistrobus have spores of the CoJumnisporites type. Cheirostrobus is an unusual cone that is often included in the Sphenophyllales because of its occurrence in Mississippian deposits rich with SphenophyJJum stems. The cone exceeds 10 cm in length and includes whorls of 12 bracts each. The bracts of C. pettycurensis (Scott, 1897) are more complex, in that each is divided horizontally to form two lobes, which are, in turn, subdivided into three segments. The upper segments produce elongated, flattened sporangia that extend inward toward the cone axis. The lower segments divide again to form three bracts; spores are ~65pm in diameter. LiJpopia ranges from the Late Pennsylvanian to the Early Permian and also has an unusual fructification organization. It is known from only a few localities in Europe, including the Karniowice travertine near Krakow in Poland, Crock in eastern Germany, and Sobernheim in southwestern Germany (Remy and Remy, 1961; Conert and Schaarschmidt, 1970; Lipiarski, 1972a, b). 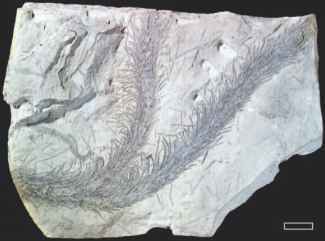 The most complete specimens come from the Early Permian of Sobernheim (FIG. 10.23) and have been assigned to L. raciborskii (Kerp, 1981, 1984b). The lateral axes have normally developed vegetative whorls, both above and below the fertile region. 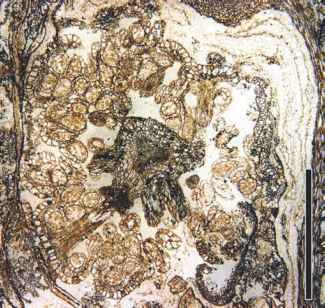 The vegetative organs of the Sphenophyllales are relatively uniform throughout their geologic range, with the reproductive organs demonstrating greater diversity. All the taxa described to date are homosporous, with either mono-lete or trilete spores. An ultrastructural analysis of the spore wall of a number of taxa suggests that the group is a natural one (W. Taylor, 1986). This species is reconstructed as a vegetative axis with nodal whorls of six wedge-shaped leaves. Extending from the vegetative axis are loosely organized, lateral axes with intercalary fertile regions (FIG. 10.24). The fertile regions are characterized by whorls of laterals, consisting of three clusters of sporangia alternating with three bilobed leaves (FIG. 10.25).